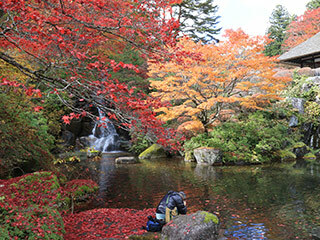 Koyo at Kohoen Garden (古峯園の紅葉) is one of the best Koyo in Tochigi Prefecture. Kohoen is a large pond surrounding garden located next to Furumine Shrine. Around the early November, it has a beautiful Autumn leaves. Admission: 300 JPY for adult, 200 JPY for kids. 1. use JR Nikko Line to Kanuma Station. 2. use a local bus to Furuminejinja. Kohoen is a garden of Furumine Shrine. It is located in Kanuma, Tochigi Prefecture. It is a large pond surrounding style Japanese garden. Each season, this garden has a beautiful feature: Cherry Blossom in Spring, Iris in Summer, Koyo in Autumn, and snow in winter.